All of these works are, of course, a massive wasted opportunity. But they can’t make things any worse than they were, can they? They could, if the announced removal of traffic lights makes crossing the road more difficult for pedestrians. But the new cage-less central reservation is supposed to make it easy for pedestrians to cross wherever they like through gaps in the traffic. We’ll see about that. But Westminster have quietly made things worse in another way. I’ve not seen any blogs mention it, and can find no note of the change from Westminster. But I am sure I do not hallucinate it. 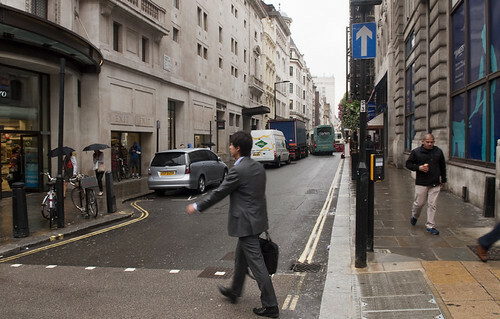 Jermyn Street runs parallel to Picadilly a single block south. 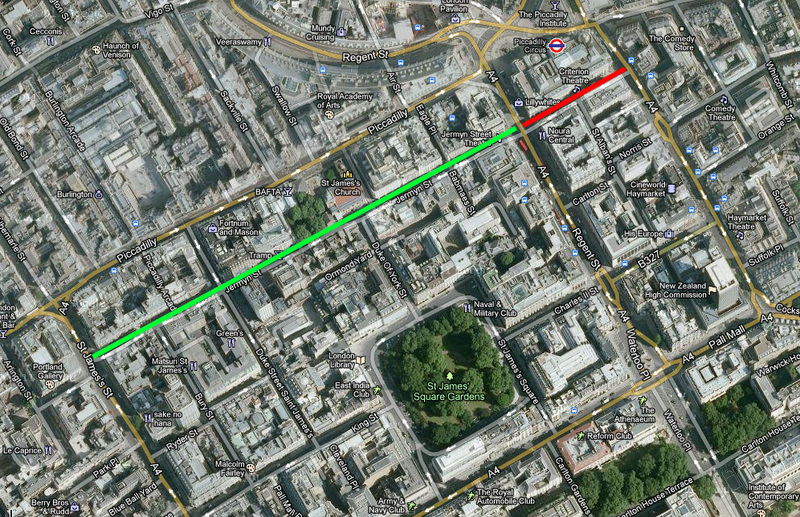 As Google Maps indicates, it’s a one-way street, westbound from Haymarket to St James Street. A quiet back street, it provides an alternative to the Picadilly bus lane, or going all the way around the system on Pall Mall. 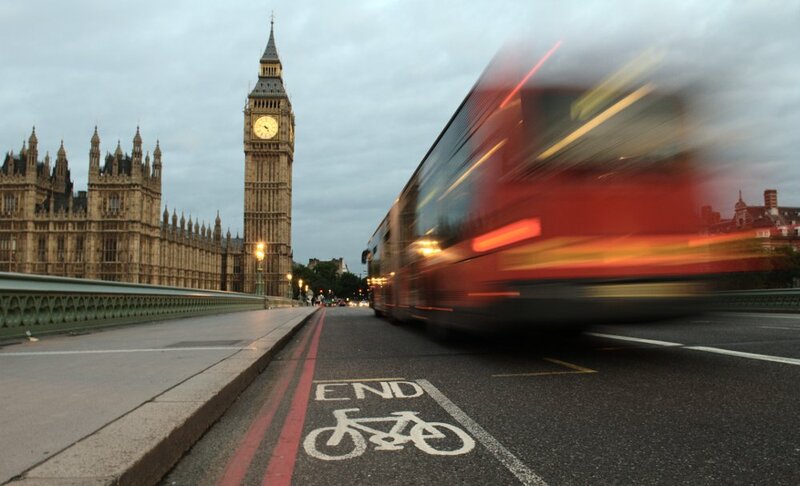 Popular with cyclists* — though perhaps Westminster wouldn’t know that, since nobody really bothers to count them. You can see where once a solid white line protected a cycle lane heading west. 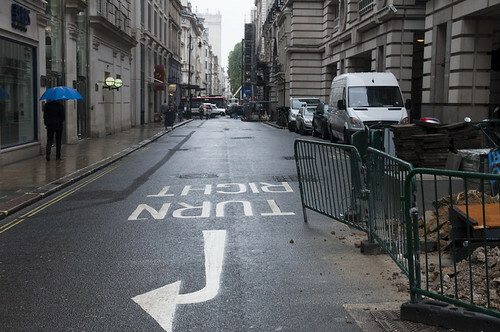 It has been burned out because this short section of Jermyn Street between Haymarket and Lower Regent Street, marked in red on the map, has been reversed, without even keeping the cycle lane as a contraflow, thus putting an end to this route. Why? Smoothing the traffic flow, of course. And it’s for the benefit of pedestrians, you know. 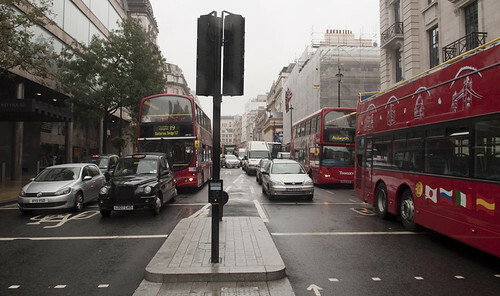 While pedestrian crossing lights remain at the intersection of Regent and Jermyn Streets (not that they are either necessary or helpful when a static bendy bus has been blocking them for five minutes), since traffic can only turn into, not out of Jermyn Street, a phase of the lights can be eliminated. You can see the previous arrangement still on Streetview: a bicycle cut through for continuing along Jermyn Street, while preventing motor vehicles using it as a rat-run. Clever of Westminster to get rid of it under the cover of fiddling with the traffic lights. The only question for which the answer isn’t obvious is whether this work was all of Westminster’s own initiative, or whether TfL put the idea to them. It’s probably for the best. 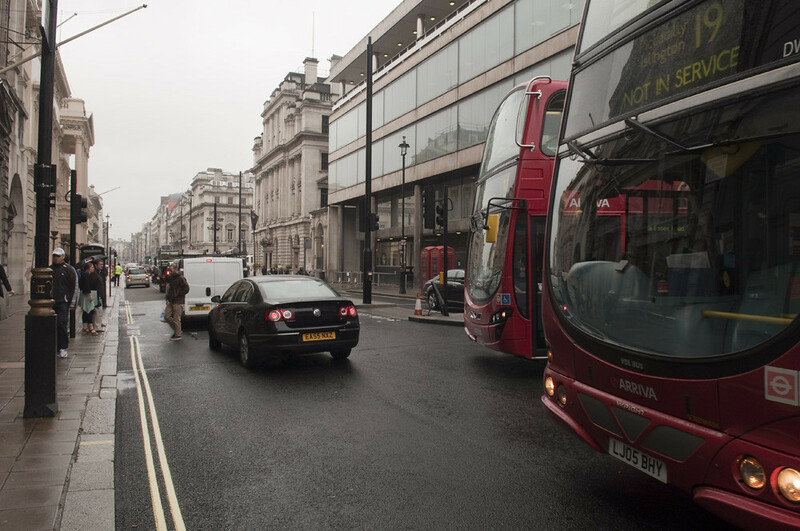 With all the chaos on Pall Mall and Picadilly, the narrow quiet route west from Regent Street is now choked with trucks and coaches trying to break out of the endless jams around it. 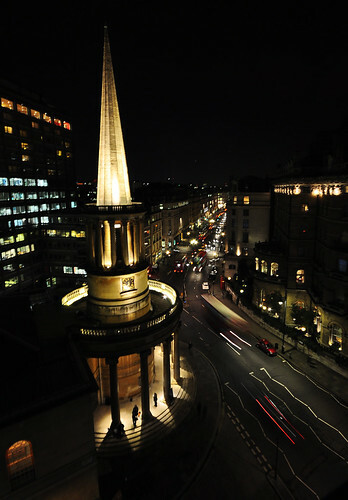 * I used the route frequently on the way to events at the Royal Institution on Albemarle Street, just off Picadilly. In the early nineteenth century, events at the Royal Institution were so popular that Albemarle Street became congested with carriages. After a particularly well attended lecture by Samuel Taylor Coleridge, it was made the world’s first one-way street, all in the name of smoothing the flow of this traffic. Mark Wagenbuur boasts that when there are road closures in his part of the world a suitable diversion route is found for people on bicycles. Well I discovered that we can do bicycle diversions here, too. Look at Horse Guards Road, a popular alternative to the wide but “too narrow for bicycle tracks” Whitehall, and which is currently closed while the Olympic Beach Volleyball equipment is dismantled after the test run. I was pleasantly surprised to see that they had thought to put in a cycling route during the road closure. Do you see it? It’s there, where those people are walking away past the cyclist. I guess they think it’s a footway, silly people. 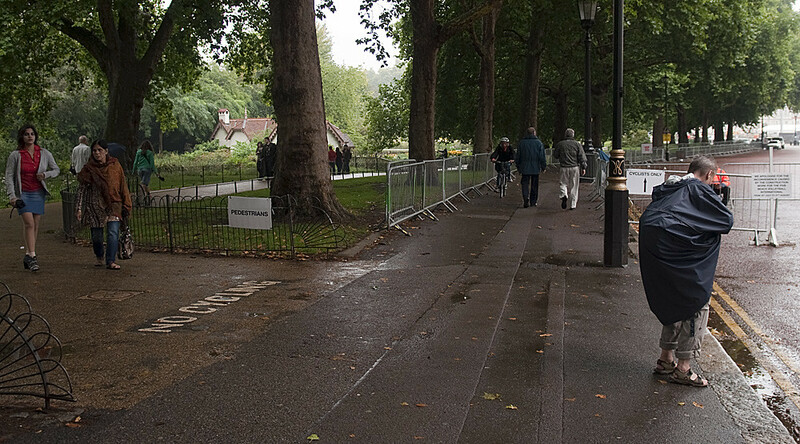 A cycle diversion was, of course, only possible on this occasion because pedestrians can be pushed out of the way into the spacious (and streetlightless) park. That’s the weekend of the Skyride, whose route is still “to be announced”, but which everyone is assuming will be similar to last year’s, which circumnavigated the park here. 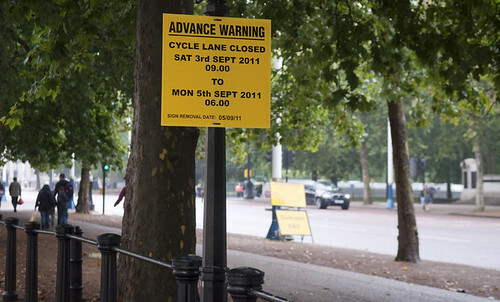 Does somebody think that the cycle lane needs to be closed during Skyride? Brian Haw had a few weird ideas amongst the good ones in his head — in that he was not unusual. But the weird ones do not mean that we don’t all owe him thanks for the good ideas and the way he acted on them. 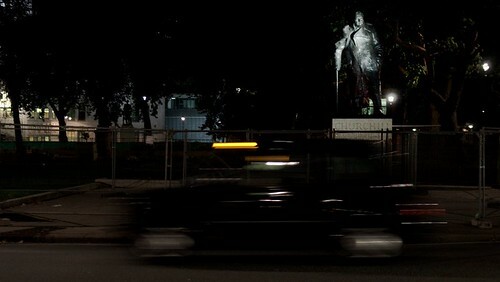 For ten years he sat in his deckchair, inches from the trucks and taxis, staring across the road, a constant reminder for the Members of Parliament who were battling their own consciences and their own constituencies to take us to war. Every once in a while one of our representatives would catch a glimpse in the corner of their eye as they walked past a window or raced across Bridge Street from Whitehall. They knew they were being watched. He deserves our thanks for something else, something unintended. Brian Haw made Parliament Square a place again. For five decades before Brian Haw pitched his tent, Parliament Square was not a place. The early newspaper reports on his protest, and on the attempt in 2002 to prosecute him for obstruction of the pavement, call it what it is: a traffic island. At its narrower points, Parliament Square is four lanes of traffic. At its widest, five lanes guide us to various parts of the city. They multiply and slew off, and whisk us around the sharp corners of the square, stop start through the traffic lights, quick accelerate to be the first to join the back of the next traffic jam. Sometimes the lanes simply disappear completely and you are pushed into a clear wide expanse of cracked and patched tarmac, taxis to the left of you, articulated trucks to the right, all eyeing up that same middle lane at the next set of lights around the corner. In 2008 I worked in an office in Fitzrovia, and so Parliament Square was on my morning roller coaster ride from South London — and what a roller coaster ride it is. Parliament Square is a traffic island not a place. Churchill looks out from behind the now apparently permanent mess of crowd-control barriers not upon the inheritors of his seat, but down upon the brave new world that rushes past him all day and all through the night, isolating him from human contact. When, in autumn 2002, Westminster Council attempted to prosecute Brian Haw for obstructing the pavement, the judge threw them out. Who is he obstructing? Nobody is trying to walk on this pavement, the judge pointed out, for there is no pedestrian crossing into Parliament Square, and nobody walks out across five lanes of heavy traffic. But over time the newspaper coverage slowly changed. The references to Haw’s pitch as an isolated traffic island faded. Perhaps the authorities actively encouraged this change in perspective, recognising that the Square’s image problem was hindering their campaign against Haw. It’s difficult to work up opposition to man sat out of the way on a traffic island. Perhaps it just came naturally, as the Square slowly, occasionally, became a place. People began to make the crossing — it can be done, so long as you’re fit and fast, most easily from the south-west corner, if you know the square well and learn the cycle and timings of the lights. They crossed to talk to Brian and bring him food. Or they crossed to take a closer look at the statues, or to walk amongst the flower borders and trees. Local office workers even started using the square for lunchtime picnics on sunny days, if they could tolerate the noise and the smog. But it was still strangled by the vast old-fashioned urban road system. When the Democracy Village camp moved in and pitched a couple of dozen tents, they were quickly jumped upon for killing the grass. But what is remarkable is that there was grass there to be killed. The great squares of the great cities of the world are not turfed. They are paved, because great squares in great cities draw great crowds, who walk and run and play and dance and march — the things that people do at the other end of Whitehall, unseen by our parliamentarians, in Trafalgar Square. Grass does not grow in the great city squares of the world, but for sixty years it grew in Parliament Square. Parliament Square was not designed to be a great city square. 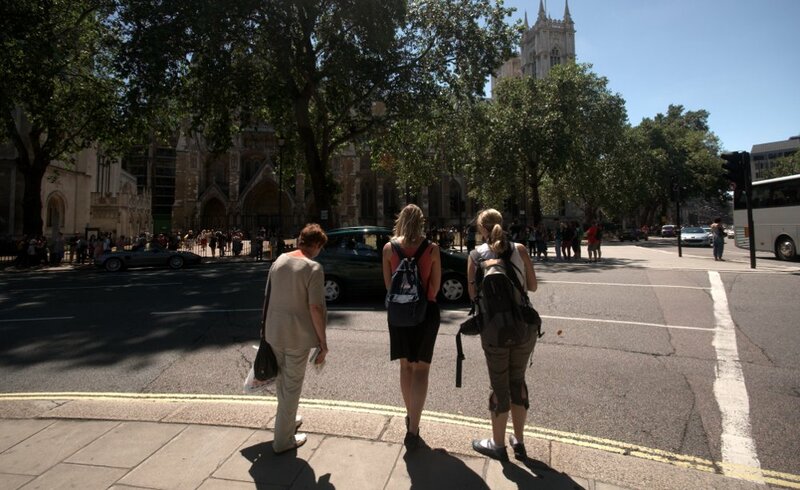 Its turf and lack of crossing points indicate that its designers were deliberately designing out people. 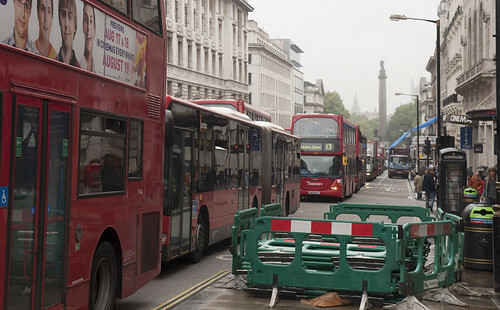 The purpose of Parliament Square was to move motor vehicles from Whitehall to Westminster Bridge, Victoria Street to the Victoria Embankment — as many as possible in as little time as possible. It was not intended that people would walk amongst the statues or picnic beside the flower beds. Not only would they disturb the hard-working politicians, they would disturb the traffic. And until Brian Haw made his camp, people knew that. Nobody ever made that crossing. The tourists probably assumed that it was illegal. This was a traffic island, and that’s what the newspapers called it. For ten years parliament, Westminster Council, and both our former and current mayors spent an inordinate amount of time trying to evict Brian Haw from his spot on the pavement opposite the palace. They charged him under every law they could find, and when they ran out, they started passing new ones especially for him. It became an obsession, with the thought of Haw sat there, staring at them, inciting great vitriol from the members. 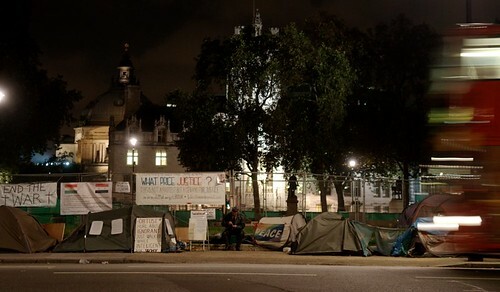 Tom Harris (lab) of Glasgow South described Haw’s tents and banners as an eyesore, while Malcolm Rifkind (con) of Kensington went so far as to say that Haw’s camp (and the others who had followed his lead) was an international disgrace. Both of them felt that the mayor was not acting fast enough in having Haw evicted. Finally, three weeks ago, as Brian’s protest quietly ticked over its tenth anniversary, the man himself now absent and dying, Westminster Council took the last action that was available to them — action that they had clearly spent nine years desperately hoping to avoid having to take. 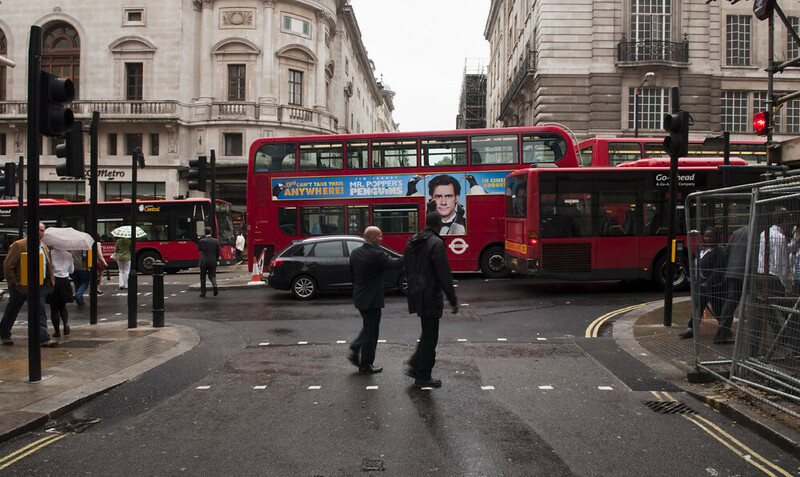 They began plans to install a pedestrian crossing onto the Parliament Square traffic island. The crossing would be in the south-west corner, the option closest to the camp. With tourists finally able — encouraged, even — to cross the road, protesters could finally be prosecuted for obstructing the pavement. Westminster Council did not even attempt to disguise their reasons for proposing the crossing. If it were built, and the protesters successfully evicted, how long do you think the crossing lights would last before quietly being wrapped away behind orange plastic in the night, a lonely “pedestrian diversion” sign left gathering dust on the pavement? Now that Brian Haw is dead, Westminster might be saved ever having to install a crossing at all. The Member for Glasgow South can finally stop worrying about being watched and return to the tasks that the people of Cathcart elected him for. And Parliament Square can go back to being a non-place, a transport corridor sat between church and state. 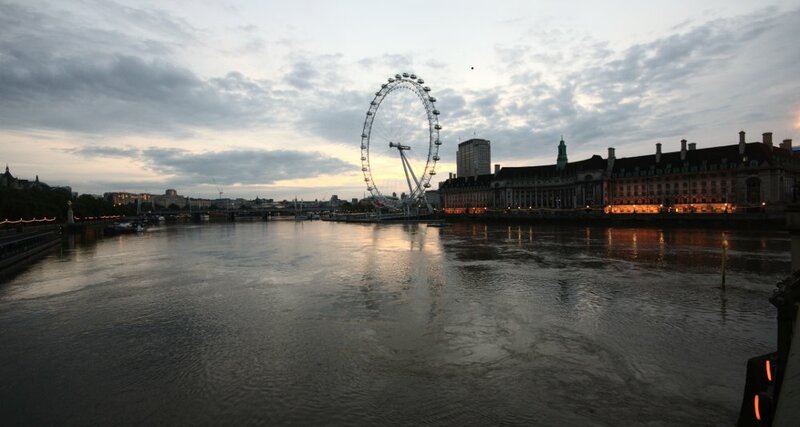 With a World Heritage Site on one side, and a heaving tube station, the river, and iconic architecture on the other. In the middle, our little international disgrace. Waterloo Bridge is delightfully empty still, thanks to yesterday’s fire. Somehow, London’s roads seem to have been coping with the reduced capacity. Most of the traffic is simply diverting to the next bridge — Blackfriars — where, as St Paul’s announces five, they have a sufficiently uninhibited run to hit forty or more before they make it to the red lights and temporary twenty limit at the now infamous north junction. Dawdling past them on an average hybrid bike without lights (but that’s hardly needed by now anyway), a man in an old helmet and orange hi-viz bib heads north on the pavement. I stop him briefly to ask him where he’s going and what he knows about pavement cycling. He can’t talk for long — he’s come from Lewisham and has to hurry on to a zone 1 tube station, I won’t say which, for an early customer services shift. It shouldn’t surprise anybody that the reason this railwayman was cycling on the pavement is because he is terrified of mixing with vans and minicabs that are autopiloted through a cycle of rapid acceleration, flagrant speeding, and sudden stops as they tour the traffic lights of central London. He was vaguely aware that he wasn’t actually allowed to cycle on the pavement, but since he only dared cycle in these quiet early hours, with just a sparse scattering of tired night-shifters and early-rising joggers to negotiate, he had a reasonable argument for it being a victimless crime. He’s only cycling because the trains don’t start early enough. He would never attempt to cycle anywhere when heading home through the bustling streets of lunchtime, road or pavement. He isn’t crazy. You’ll recognise these sunrise pavement cyclists from the work of Dave Horton: they are the people, often poor and marginalised, who cycle despite all of the barriers, just because there really is no alternative. So when somebody high-up in TfL tells you that speed of motor-vehicles doesn’t matter outside of the rush hour, spare a thought not just for those who want to use their bicycle for things other than a commute, and not just for the schoolchildren whose day does not align with the normal rush, but also for the tens of thousands of Londoners who work non-standard hours, scrubbing the front steps of the powerful and making sure that everybody else’s morning trains run. TfL directors, it turns out, are failing in their duties to their own staff on the ground. Who would have believed it possible? And after all that, it wasn't even worth it for the photography. The clouds soon gathered for a boring grey morning. Central government have decided to roll back their red tape and give power back to the people! In reality, this is power going to the county and borough councilors (who don’t have the budgets needed to do anything productive with their new powers), or in some cases it could amount to less power for the councilors to resist the pressures of developers. It is now more important than ever to keep an eye on local developments: to provide the local opposition that the councilors will need if they are to justify turning down bad proposals, and the local support that they need to get funding for good proposals. For those who don’t care about London (or care about more than just London), I’ll compile another post. The London Authority requires the boroughs to periodically outline their transport plans for a forthcoming timespan, to compliment the Mayor’s own transport strategy. The last set of plans were written five years ago; it’s time for the boroughs to produce new ones and consult with their “stakeholders”. These plans will include specific detailed initiatives for the next few years, but also propose high-level policy directions for the next few decades. The boroughs should make these plans available for everyone to read, and any of you can give feedback if you think you hold any stake in the future of transport in that borough. You don’t need to be a resident — you could comment on a borough that you work in, commute through, or even which you never visit, but whose transport plan you think could have knock-on effects on your own borough’s transport situation (I never visit the northern or western outer boroughs, but it is their pro-car policies that help make much of the central area a nasty place to be). When reading the LIPs, check what the council plans to do to make the city livable — their plans, if any, for calm residential streets, pleasant high streets, and cycling infrastructure that actually works. And watch out for failed fantasies like “congestion relief” and “smoother traffic flow”. The City of London — Cyclists in the City have an excellent series of posts on what is wrong with this car-centric plan, and resources to help with sending your feedback. Camden — traditionally one of the more bicycle-friendly boroughs, and don’t forget that it includes a reasonable chunk of the central zone. They have a helpful form to make sending your feedback really absurdly easy — you have no excuses. Southwark — another more progressive central zone council. They have a survey too, it takes seconds to fill in. Other inner boroughs that you might need to travel through: Lewisham, Lambeth, Tower Hamlets, Wandsworth, Kensington & Chelsea. I couldn’t find anything for Hackney, Islington, or Westminster — perhaps those are not ready yet. I also searched for Waltham Forest, for a laugh, but they too have nothing obvious available for comment so far. If you can find those, or any other LIPs that are worthy of comment, do let us know. So far I haven’t looked at the content of any the LIPs except the City, Camden, and Southwark — if you do look at any of the documents and spot anything outstanding or outrageous in them, let us know. Subscribe the TfL’s consultations — they include major streetscape changes on the red routes, Bus routes, taxis, etc. Find your borough’s streets & transport consultations web page — e.g. Lewisham’s is here — and subscribe to it (if the council are too useless to have provided their own feed, you can improvise one with tools like this). Look out for changes to speed restrictions, official approval of pavement parking, poorly designed one-way systems, etc. Most consultations are small and dull so get very few responses, and proposals easily go through unopposed — but this means that when people do speak up, they can potentially get noticed more easily. Also keep an eye on the major projects in the central boroughs — especially Westminster and The City, since these are usually designed to support our current car-centric mess. 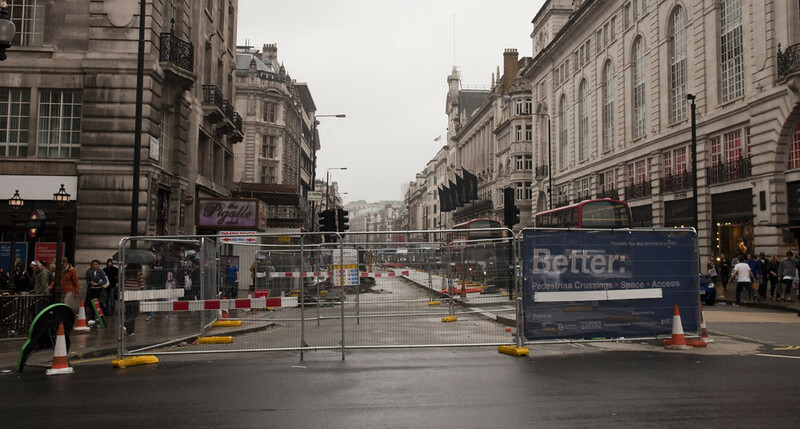 Westminster’s transport/streetscapes consultations page was particularly difficult to find, but I believe this is it. It includes their proposals for half of the grubbier eastern end of Oxford Street, to be built later this year: more car parking spaces and loading bays; helping pedestrians by, erm, pushing them onto other “under-utilised streets” (shove ’em round the back by the bins — that’s gotta be good for business); and no mention of cycling at all. (Of course, what Oxford Street and its traders desperately need is proper pedestrianisation — but then, this same observation was made in the 1963 Buchanan report and it hasn’t happened yet.) You have two months to send Westminster your comments on that one.